In Colombia’s coffee-producing region of Risaralda, small trees run along the sharp incline of the Andes Mountains, carefully tended in tidy rows. Thousands of green coffee berries turn brilliant red as they ripen, ready to be harvested by hand. The steep hills here prevent mechanised techniques. Despite their global reach, coffee farms in Colombia are generally family-owned and modest in size – perhaps five to 12 acres. Over 90% of the coffee farmers reported changes in average temperature. Seventy-four percent said droughts had gotten longer and worse and 61% reported an increase in mountainside erosion and landslides because of more rain. The farmers also perceived impacts of these environmental changes on their crops. Ninety-one percent reported changes in the flowering and fruiting cycles of the coffee plants. Seventy-five percent had noticed an increase in pests, and 59% reported an increase in crop disease. Organising labour to pick the coffee beans has also become a struggle because the trees often do not flower at the same time due to unstable seasonal conditions. New Colombian labour laws meant to decrease child labour make finding farmhands difficult, compounding the problem. 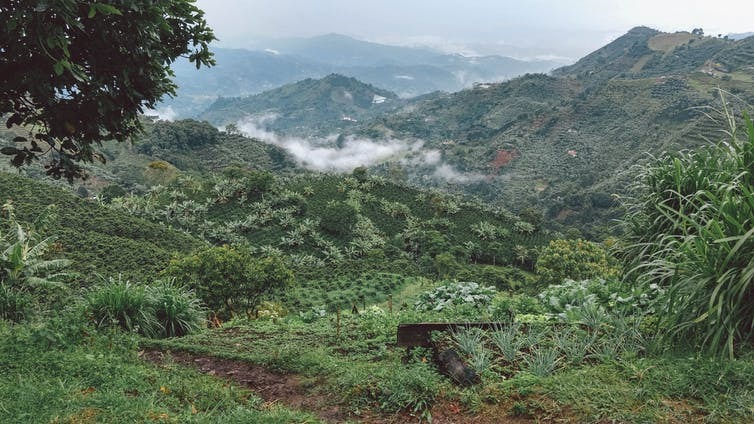 From 2008 to 2013, Colombia’s coffee production dropped approximately 33% due to the El Niño and La Niña inclement weather patterns, when rains, clouds and hot spells all increased. The country has worked to increase its production since then and this year Colombian coffee farmers are expected to produce 13.3 million bags of coffee beans – roughly 1.8 billion pounds – up about 23% from 2013 levels. Most producers sell their coffee to the Colombian National Coffee Federation, a non-profit cooperative founded in 1927 to represent Colombia’s coffee farmers nationally and internationally. It values Colombia’s coffee exports using a price scale tied to the New York Stock Exchange. Coffee is the South American country’s most important agricultural export, representing 31% of all agricultural trade. The industry is worth around $1.97 billion a year and employs an estimated 800,000 people.